Although I can’t claim we spend our days in yachting whites, we aboard Papillon do make an effort to meet a minimum standard of grooming. This isn’t always easy when your choice is between sufficient drinking water and a nice shower, but we do our best. One of our persistent problems has to do with hair. Let’s face it: we’re a hairy boat. So how do we manage those strands of waste protein that just won’t stop growing? When I was little, Saturday morning was not complete without cartoons on channel 29 out of Buffalo. One of the staple commercials breaking up He-Man and Scooby Doo was The Hair Club For Men. Happy clients shook their newly-thickened locks as they cavorted in hot tubs with young models in blue eyeshadow and grinned knowingly at us, the viewers, around their Burt Reynolds mustaches. I never understood why men would want those elaborate, shiny perms, and I put it down to Strange Things Grown-Ups Do. Maybe the problem was that I didn´t identify with the untamed styles of the late 70s. In my family, hair was neatly cut, no matter whether you tended to the thinner end of the hair continuum, or you fell on the hairy end of the curve. When my brothers were about seven and ten, a movie was filmed at their summer camp. My brothers were instantly cast to wrestle in the background of a certain shot. Why? Because the movie was set in the 50s, and their crewcuts were perfect. The girls had long hair when they first boarded Papillon; they now they have considerably less. Between the salt and the sand and their casual acquaintance with the hairbrush, they were starting to look somewhat feral. Chop, chop. I bought a proper pair of scissors from a beauty supply shop and, when we couldn’t find a decent (read: cheap) haircut, Mom would do the honors. And I’d like to claim that I can produce a fairly decent bob. I’ve promised them they may grow their hair when they can take care of their hair; we’ll see when the magic day arrives. As for me, I have long, straight hair. Erik won’t go near it with the scissors, so about twice a year I find a salon, have it trimmed, and that is that. And then there is Erik. His hair is a thatch. Curly in childhood, it is now a wavy landscape of wiry bristles that obey no man. If you have ever seen an aerial view of Mayan pyramids still buried in the jungle, you will have an idea of what I mean. This mystified me at first. I am no stranger to full hair; my father’s family – every man, woman and child – grows hair in what I can only describe as a luxurious abundance. My nonagenarian grandfather still sports a snowy coif to put one in mind of Cary Grant. But every man Jack of us has straight, manageable hair. Not so my husband. Make no mistake – his hair is the envy of men half his age. It is thick, grows quickly, and there is an almost-impossible volume of it sprouting from his noggin. (If you are familiar with the Artemis Fowl books, Erik has Mulch Diggums hair – impossibly thick and quite possibly alive.) But, he has only sixty seconds after leaving the water to brush or otherwise manage his hair. After that, the die is cast. Nothing will shift the geologic strength of those patterns. During the decades we’ve been together, Erik’s hair has slowly gotten shorter. In high school he sported a mop that followed the letter, if not the spirit, of our school rule that a boy’s hair never fall below his collar. Gravity had no effect on the twisting strands erupting from Erik’s head; the hair just went up, up, up. He cut it shorter during university to ease the summer job hunt, but the peaks and valleys returned quickly if he didn’t keep ahead of the game. On the boat, Erik’s hair has gotten shorter still. To his delight, Erik discovered that he has Latin American hair. This meant the haircuts he received through Central America were the best and most ridge-free he had ever enjoyed. By the time we reached the Galapagos, Erik was sporting what the girls and I dubbed the Caesar look, and, as a totally unbiased onlooker, I must say he’s looking pretty good these days. The problem is, the ‘fro comes back: the new hairdo won’t last much beyond 3-4 weeks. So, when we got to Tahiti, we decided the time had come to buy our own set of clippers. No more paying an outrageous $3 for a haircut! I could figure out how to work the clippers before we left on passage, and any disaster would grow back by the time we hit land again. Simple. Brilliant. We perused the clippers at the department store. We bought what looked like a robust pair. We took them home and opened the box. After some debate, we decided to start with the conservatively long teeth, just in case things didn’t go smoothly; ie. let’s not scalp Erik right out of the gate. Bzzz brrrrp rruh rruh rruh. I turned off the clippers and gently teased them out of Erik’s hair. I looked at them. Three sad wisps sat in the hair catcher. I pressed the button again. Bzzzzz! The clippers buzzed merrily in the air. I put the clippers back against Erik’s head. Bzzz brrrrp rruh rruh rruh. We were stuck again. We switched to the shorter teeth. Then the shortest teeth. Rruh, rruh, rruh. No go. 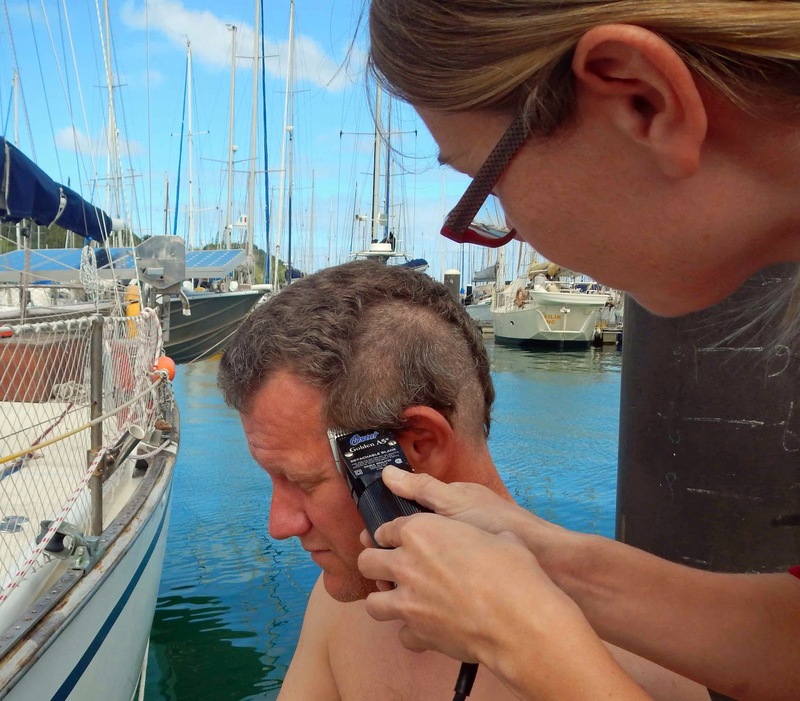 All thoughts of saving Erik’s delicate scalp were gone – we cranked the dial to eleven. Erik’s hair just tangled in the clippers and refused to be cut. I think I heard it snicker. We debated the problem with our male friends in the harbor. They laughed and ran nervous hands through their own fine hair. Everyone agreed: Erik has too much hair for man-clippers. And he tried. He went to every pet store in Papeete trying to buy dog clippers, but there were none to be found. I don’t suppose many sheepdogs roam the tropics (and if they do, they don’t last long in that heat). Worse luck for Erik. He is getting shaggy again. The pyramids are slowly erupting through the Caesar cut. But in a few weeks, we will be in New Zealand. And if there is one thing Kiwis know, it is how to separate a fleece from its owner. Industrial clippers, here we come. He had to wait until Christmas, but Erik got his clippers. And, as you can see on the box, they are indeed intended for the furrier among us: namely, poodles and horses. But they work a treat. I’m slowly getting better at giving Erik a nice,smooth haircut. Lucky for me, his hair grows so rapidly that even the worst errors would grow out in a week. Point is, thank goodness for the Osters. And let’s hope the kids never get their hands on them.